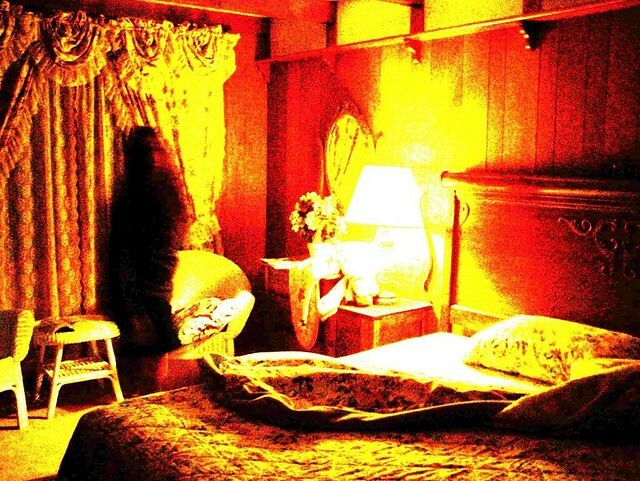 Here is an image I captured last year in my motel room in Virginia City, Nevada. Look at the mirror to the right, no reflection. I also believe there is a second spirit. 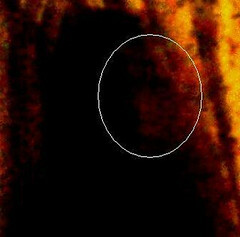 You can make out a face over his shoulder. First image is original and untouched. I played around with the image and was amazed to see the shadow take the shape of a man. "In sight we are blind, and the blind have sight." 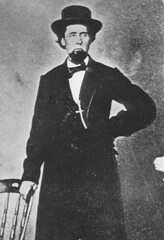 The image was taken at The Comstock Lodge. 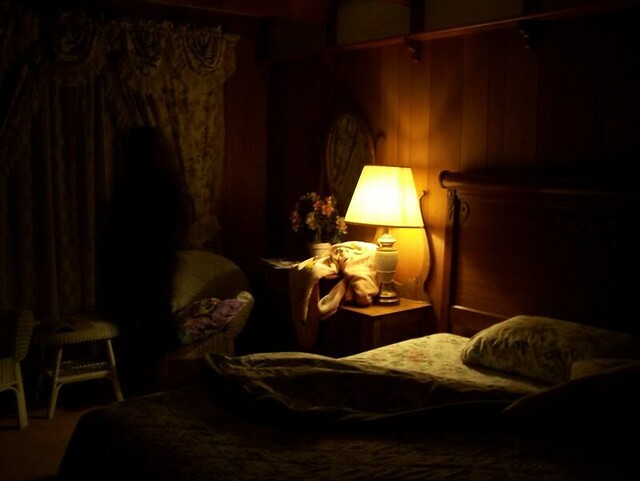 We left the lamp on so when we returned at night the room would not be dark. When we arrived the room looked creepy! I started snapping off some pictures to show my family back home. We did not experience any paranormal activity. I took the image last August and was not until this past weekend while looking at our pictures that my wife noticed this one. I have since contacted the owner of the Lodge and asked if there have been any ghost sightings from guests, she said no. The only thing she recalls once a couple checking in did not want room number 9. They had heard it was haunted. My room was number 8, so maybe 8 and 9 are haunted. I think the "face" is just detail from the curtain showing through the shadow. I don't think the position of the shadow requires it to show up in the mirror as a reflection. It could be closer to you that it looks, and could be just far enough to the left to be not picked up by the mirror. As for what the shadow is, thats difficult to say. In a dimly lit room, with no flash, people can show up like this. But I can't say if it is or isn't. I do think that under those lighting conditions that it could be something quite normal, whether we can identify it or not. RJuarez, welcome to Ghoststudy. I really like this photo and agree that it's quite creepy! I agree with Snowlord, though, that there are a lot of variables to consider when it comes to low-light shots like this and that it can be difficult to come to a conclusion either way. Was there anyone else (friend, family member, significant other, etc.) in the room with you when this shot was taken? If so, can you be sure that this wasn't them walking around in that part of the room when you took the photo? I've seen photos of living people that turned out this way due to poor lighting and motion blur, so that's why I'm asking if we can rule this out. As far as the lack of reflection in the mirror, it looks like the figure might not be standing in line with the mirror. If you look, you'll see the curtains on the left reflected in the mirror. The mirror seems to be catching that side of the room, close to the wall/window. 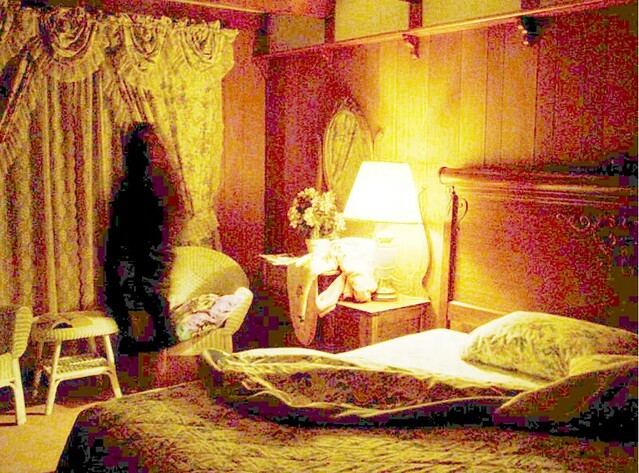 So judging from the angle that the photo was taken, the figure may not be visible in the mirror simply due to its location. The lack of reflection is interesting, but I think it may be explainable. Either way, this is a cool photo and I'm glad you posted it. Right now, I'm not sure what to think of it. If you're certain that there was nobody else in the room with you (or at least nobody within the frame of the photo), then you might have something here. Interests:Day dreaming, drawing,reading ghost stories, watching movies,planting,painting,music,video games,gem stones,writing to my spirit guides. I'm Sum 41's # 1 fan and they know that!!! One of the bestest capture I ever seen! I think that they tried to take a picture with the big one from the closet but it didnt make the same effect then they tried with the small one. I dont know the effect used to make it black shadow. Edited by EMPEROR_SO, 30 April 2008 - 03:22 AM. It really looks like someone standing there. Yikes! I can almost make out a fedora type hat on top. I agree the "face" is an illusion from the curtain. Otherwise, if you are serious that no one was standing there - Holy Cow! Cool pic.... thanks for posting it. Some more information for thoses interested in exploring further. There was absolutley no one else in the room. I went in alone to set the bed for my daughter. 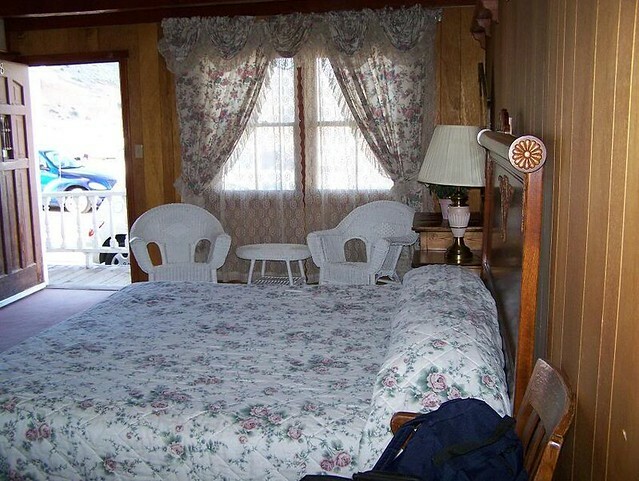 You'll notice the sheets on the bed are pulled back, that is the reason. My wife remained in the car just outside with my daughter who was asleep in the car. So the possibility that I captured one of them is impossible. I also thought maybe the face was the curtains, but I was not sure and thought I would leave that up to the reader to decide. About the shadow not being in the mirror; If it were just a shadow, it would follow the drapes and should be in the reflection. There are many points of reference to see more or less where this shadow was standing. Another weird thing is the lamp was the only light source in the room. The shadow figure is casting two of it's own shadows going in different directions. From what I can see, with the excepions of the shadows outlined in white, the shadows are all consistent with the lamp being the only light source. The blue and green lines are just for reference. I have included an image from the day when we arrived. The daylight pictures were taken because my wife had a good laugh that her mother has the same drapes in her house. They have a thing going where they joke around that nothing changes at my mother in laws house. I have been doing some research calling on other motels and business's in the area. Perhaps I have captured Henry Comstock of the Comstock Lode. He went insane and killed himself. Did it in Montana not Nevada but his mine, the richest in history built the town. Perhaps he has returned. If there was a soul that would not be settled he would be one. Having sold his interest cheap not knowing the millions that would be made from it. This is a genuine spirit/soul. There was no attempt to make this a "fake" what you are seeing is 100% genuine and I feel fortunate to have captured it. Rather than the leg disapearing it looked to me more like the figure is perched on the edge of the chair arm with the leg bent at an angle. Similar to what someone else said about it being crossed. If you really are sure that no one else was in the shot then well done! I love it!!! Your getting so popular!! Let's have a ghoststudy party!! Work like you don't need the money; Love like you've never been hurt; Dance like nobody's watching! wow thats a really great capture. 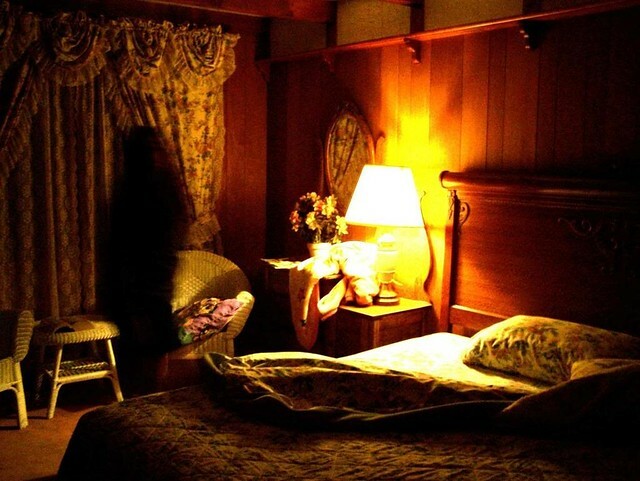 If all natural causes have been ruled out I think you got yourself a genuine shadow ghost capture. Well done. to me, it does not look like a man, but a woman looking at the camera with her hands in her pocket, kind of slouched, standing so her left side is facing the camera...with a dress/skirt and bare legs. I am curious though, with low lit photos, why is it "questionable" what it may be, when you can lighten them up so much digitally? (like Dem and Juarez did?). When you are lightening them up afterward on the computer, it isn't trustworthy? Edited by Ubriaca, 01 May 2008 - 10:50 AM.